do you want to make one of us? I really hope so because work on patternbook volume number 1 is underway! Dolls are done, pattern pieces are scanned and now it’s time to get working on the diagrams and instructions and the fun stuff – design and layout. Right now we’re in the middle of a heated discussion on scalloped borders. Wish us luck! I can’t wait for the patternbook! hurray! can’t wait to see the final result. If there is a God, there will be a pattern in that book for a kitty like Flora, Fauna or Merriwether. I have been waiting sooooo patiently for a pattern for a kitty like that. Please please please let there be one in the book. Please? OMG OMG OMG!!!! I am so excited! I can’t wait to get this when you make it available!!! They are all so cute! I want, I wat, I want! like everyone else I’m so excited to see the pattern book! HOw adorable! I’ve never done a sewn critter, just knitted ones, but I just got a sewing machine, so guess what….. I like the kitty fabric you used on the orange one. And the little placket! With the little orange buttons! Melt. Can’t wait for the pattern book! Yay! What a great post to wake up to!! I’m really excited about the prospect of sewing up those lovelies!! I can’t wait for the book! I would love to make any of them! Can’t wait. scalloped borders? sounds just lovely! Yay! I will be one of the first people to buy your pattern book, I’m sure! yay hillary! good luck. i’m sure it’s sooo much work to put it together…can’t wait. yes please! if you need votes for scallops, i say you can never have too many! Your dolls are so cute. You’re pushing me closer and closer to my sewing room. Can’t wait for your first pattern book. I don’t know if publishing a book was part of your “dream” – but having a book of your wonderful patterns is certainly one of mine – thank you ! GIMME GIMME GIMME! Sorry, channelling my 4 year old for a minute there, but I want those patterns!!! Go, go, go, Hillary! Have fun, and remember to tread lightly when it comes to discussions on religion, politics, and… scalloped borders. YAY Hillary! I’m so excited – I can’t wait to spoil my little niece and nephews with your goodies! scallops are good with linguini! Yes, please! I can’t wait for the opportunity to buy your book! Hoory – so exciting! Love the mushroom fabric and I agree with most of the above – thumbs up to scalloped borders! Hooray! I’m so excited for it to be ready! YES!! I want to make one!! eeeek…better learn how to sew!! wishing you luck!! Love your site! Can’t wait for the patterns! ooh can’t wait, do print lots and lots! When you roll through Portland on your book tour we’ll all fight to keep you! What was your inspiration to start knitting, crocheting, crafting? What was your first serious or not so serious project? What would you like to tackle next (other than your significant other )? And last but, not least, if you could give one peice of advice to a beginner what would it be? oh a collection of your softie patterns? of course! Best of luck. I can hardly wait. Your dolls are wonderful! Yes, I want the patterns, please. Oh!! That’s a fantastic new! Congratulations. Enjoy the process! That is wonderfuland a big Congratulations on finishing your pattern book! 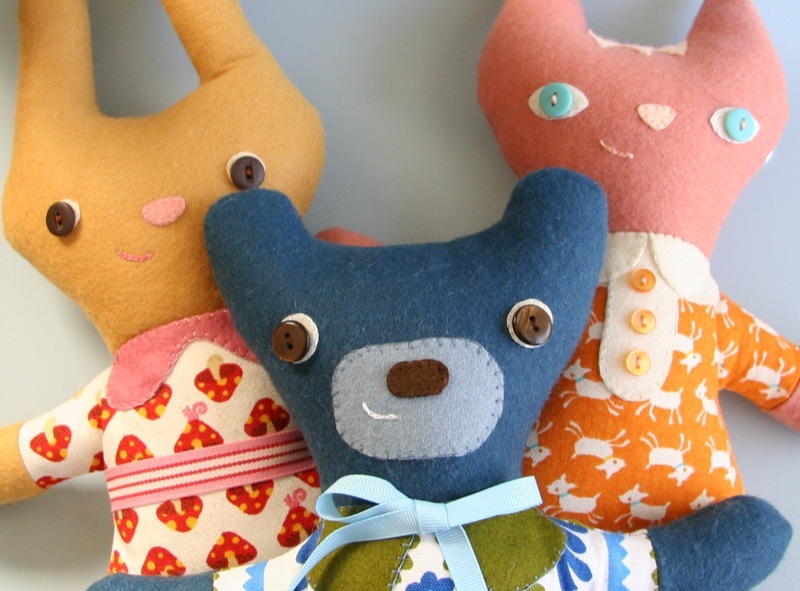 I love so many of the toy patterns you make and can’t wait to make them myself now. They are great gift ideas. I made the Pointy Kitty and gave it to my sister-in-law and she adores it. Thank you!!! Oh I can’t wait to see it! Where will it be available? wow-so excited for this!! and YES to scalloped borders, or scallop ANYTHING, i say. can’t get enough!! YES YES YES oh and YES!!! Thanks so much, and good luck with the booklet’s design! I can’t wait for the pattern book! I’m relatively new to sewing so I hope by the time it comes out I’ll be up to the task. I just adore your work! Oh goody goody! I have to say I have been so totally inspired by your site and CAN’T WAIT for the pattern book! send me an email when they’re for sale…consider this a “reserve one”! very very cute orange fabric on the kitty on the right! Love it- can I get on some kind of list when this is available? ?